Saturdy 25th March: Leeds – Grove Inn, 8pm. I will be delivering full 20-minute verbal assaults at both shows. Dale Prudent will be doing likewise. 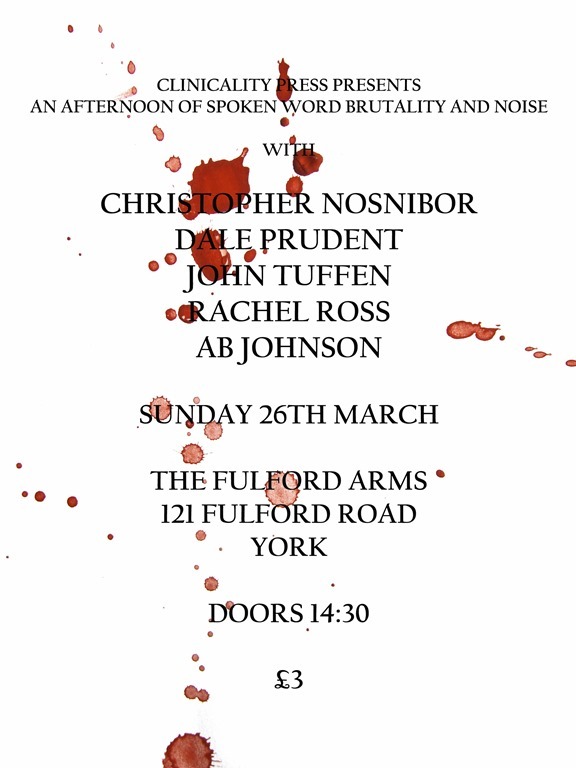 We will be joined in Leeds by Joe Williams and Karl Whiting, and by AB Johnson (Stereoscope), John Tuffen (Namke Communications) and Rachel Ross in York. I’ve spent a fair few nights watching live music in the last 12 months. Many have been outstanding. I’ve seen acts I had spent half my life waiting to see, I’ve seen some of my favourite acts in unexpectedly small venues, I’ve seen over a hundred acts for the first time, and found new favourites. I haven’t attended quite a gig a week, but it’s not been far off. It’s been fun, and it’s involved the consumption of a lot of beer, and a of time in particular in The Brudenell Social Club and The Fulford Arms. However bad things have been in 2016 socially and politically, there has, at least, always been great live music in abundance. There is a heap of people – PR, bands, venue personages – I’d like to thank, and I’ve chatted to some ace folks while out and about. Mosly I’d like to thank all the acts I’ve seen for making it a fun year. Those acts are listed, alphabetically, below. I’ve had a blast, and suffice it to say I’m looking forward to more of the same in 2017. As is often the case, just when the diary is beginning to look a bit sparse, things happen. There are already things in the pipeline for 2017 – exciting, collaborative things amongst others – and 2016, having been a dismal year on so many levels, will find me back out and yelling at people a couple more times after what’s been my most active year on the spoken word circuit to date. Two very different events will find me deliverying different sets at opposite ends of York on Saturday December 10th and Sunday December 11th. Both events will be ace. Buy now and get it in time for Christmas. Give it to someone you love. Or maybe someone you hate. Following a clutch of well-received, high-octane readings in York and Manchester in June, July, and early August, in which I premiered some new material and collaborated for the first time with master noisemonger Legion of Swine for the first time , offers of slots for reading have been rather thin on the ground. Which means it’s time to revert to guerilla appearances at open mic nights, which is actually something I quite enjoy. 26th September 2016: Fictions of Every Kind @ Wharf Chambers, Leeds. 19:30, £3 entry. 1st October 2016: Open Mic Night @ The Basement, York. 19:30. 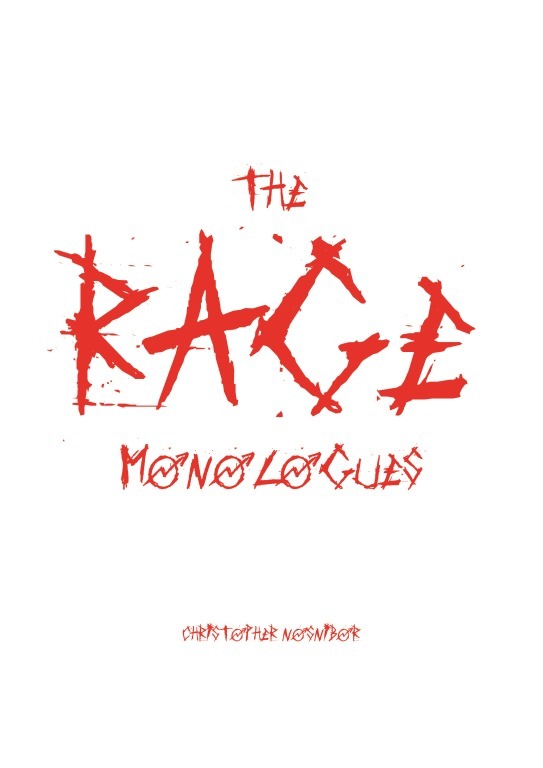 Meanwhile, there are just five copies of the limited-edition Rage Monologues pamphles left. I must be doing something right. These are priced at £3 and are available only at readings. June 26th: York Anti-Fracking Open Mic at the Fulford Arms, York, 13:00-16:00. Facebook event page. June 29th: Bad Language at the Castle Hotel, Manchester, 19:30. Event page at the Bad Languge website. July 16th: Irk, Super Luxury, Legion of Swine at the Fulford Arms, York, 19:00. Yes, this is actually happening. Facebook event page. 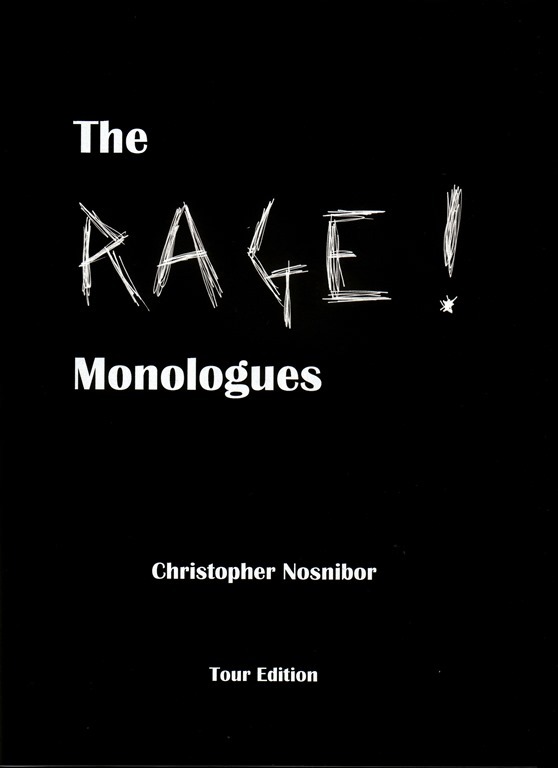 I still have a handful of the limited, numbered ‘tour edition’ pamphlets of The Rage Monologues in hand. Copies will be available for purchase exclusively at these events. Because literature is the original rock ‘n’ roll. Sometimes it feels like treading water. Trying to remain productive over and above surviving the daily grind, paying the bills, the regular essentials like eating and remembering to charge your phone. Other times, things happen. Life gets even busier, but for the best. I’m not one for a ‘tour diary’ or, worse still, a regular diary, but the last week has been hectic, in a good way. Wednesday, I made the trip to Leeds to perform at Verbal Remedies. A slightly smaller crowd than in March, they were nevertheless enthusiastic and encouraging, and my set was well received. I sold a copy of the limited, numbered tour edition of The Rage Monologues (almost half of this run has now sold) and got to chat with some really cool people. It was also something of a privilege to appear on the same bill as guest speakers Ian Winter (Hull) and Hannah Stone (York), who were outstanding. This is very quickly becoming one of my favourite spoken word nights going, and the standard of open mic performers is consistently strong. For the second time in two months, I was astounded by Lauren Butler’s lung capacity. A short clip of my performance of ‘News’ also got shot that night. There isn’t much footage of me reading, and this is probably one of the best yet. Friday saw me take the rage back on the road, this time making the journey to the Scribble night at The Shakespeare in Sheffield. The journey was stressful to say the least: I knocked off work at 3:45 and caught a bus to the station, hopping on the 4:45 York to Sheffield (direct via Leeds) which was due to land in Sheffield at 17:48: ample time to make the 17-minute walk to the venue at my pace. Signal failure at Sheffield meant that we sat at Leeds station for half an hour, during which time I began to regret the chilli-cheese wrap I’d made for lunch. The train stalled again at Meadowhall and we were advised to disembark and hop on the tram. This stopped around every 500 yards, and I finally jumped off at somewhere near but not very near the station at 18:45 in a state of anxiety and bursting with rage. I figured I might channel this into my performance later, and yes, I did, although I’m not sure how well it translated. I’d got the walk from the station mapped out on my phone, but quite lost and with the even scheduled for a 7pm, start, I hopped in the nearest taxi and made it with minutes to spare. The Shakespeare is an ace venue: the upstairs room is large and a good, plain rectangular shape with good acoustics and the bar downstairs offers 9 hand pumps and more decent beer than even I could consume. It was good to catch up in real life with Rob Eunson and to meet more new people, and while the reaction to my performance (a trio of rage monologues, during which, utterly pumped after my terrible journey, saw me leave the mic and rave manically to the audience, who looked terrified) was mixed, it was a good night. The other speakers were, again, excellent, and besides, I don’t expect rapturous applause and unanimous acclaim doing what I do. That same day, my first new material in some time hit the market. While my February publication project, Something Must Break / Dream of the Flood, was ‘new writing’ I haven’t had work featured in anyone else’s publications in a year or two. So, for ‘Ambition’, a rage piece I only wrote earlier this year and performed for the first and only timer in Leeds in March to feature in issue 3 of The Curly Mind, the on-line zine curated by Reuben Woolley, a poet I admire greatly, is a big deal. You can read ‘Ambition’ here, and it’s worth having a nose round the other work at The Curly Mind. Landing home after Sheffield at around 11:30am, it was an early start on Saturday for Live at Leeds, where I changed from writer / performer to music reviewer and landed early doors for some of the bands on at midday, and stuck it out till gone 10:30pm, by which time I’d seen 10 bands play in some five venues and on six stages, leaving myself with pages of scribbled notes from which to chisel a 1,500 word review for Whisperin’ and Hollerin’ by 10pm on Sunday. Not every week is like this, and I’m now even further behind on my email than ever. But, having started to build what feels like momentum taking the rage on the road, a hometown performance in York in May seems like the way to go, ahead of venturing to Manchester in June.